What Is An Energy Star And How Does It Help In Choosing A Good Lawn Mower? Energy Star is a program that was developed to help citizens save money by saving power on usage of electronic equipment and thereby helping to protect the environment through energy conservation. The Energy Star program was initiated by the U.S. Environmental Protection Agency as well as the U.S. Department of Energy as a joint effort to curb the growing wastage of energy resources through unconstrained energy usage. The Energy Star program not only helps to reduce the excessive usage of electrical energy, it also helps the consumers to save money on their bills. Under this program, products are given the Energy Star symbol if they help in the prevention of greenhouse effect through reduced gas emission. In order to get the star, the products will be scrutinized according to the specification of certain strict guidelines set down for energy efficiency. By purchasing products that have been scrutinized under the Energy Star program, not only do you save money on your electrical expenses, you also help in the protection of your environment. Greater usage of power energy means greater emission of greenhouse gasses which lead to global phenomenal such as global warming. But buying products with Energy Stars does not mean that there will be any deficiency in their performance. The main aim of this program is to ensure that consumers get to use the best quality products that are energy efficient at the same time. How to Choose Products That Have Energy Star? Since so much is being said about products that have Energy Stars, the next question would be how to choose such a product. Well, it is very easy simply because all you have to do is look for the energy star signs on the products themselves. Products which have earned the energy star symbol will flaunt it and you just need to check for the symbol before purchasing the product. If you are wondering if it would be difficult to search for such products then you would be surprised by the number of products available in the market that actually have been checked out under the strict rules. In fact, there are more than 60 different kinds of categories of products that are available in the market which have the energy star symbols. All the products with the energy star will help to save the environment by saving energy as well as help the customers save money. The concept of using energy star products has caught on amazingly in the last few years and more and more number of people are now aware of the benefits of opting for products that have energy efficiency stars labeled on them. There isn’t any reason why energy efficient products that give the same amount of performance as other products should not do well in the open market as the others. We as customers are very fortunate that we get to enjoy the benefits of such a program that both saves up money as well as helps to protect the environment for our and our children’s future. Do Energy Star Products Include Lawn Mowers? There are several different kinds of lawn mowers that are available in the market. The gas mowers are said to be the most energy consuming product. 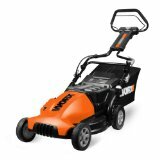 But when it comes to electrical lawn mowers, the energy efficiency is again a very important question. This is why energy star lawn mowers have become extremely popular in the market. The electric walk-behind lawn mowers are the most in demand product when it comes to grass cutting. The more modern devices are a huge improvement over the gas chugging machines that were used previously, spewing toxic pollutants into the environment. But just because you might be free of the gas mowers does not mean that the electrical lawn mowers come with no problems of their own. Usage of electrical lawn mowers means large fat bills every month. But with energy saving lawn mowers, you can get the work done with the same amount of efficiency without burning a hole in your pocket. 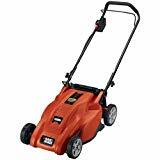 There are various kinds of electronic lawn mowers available in the market. The kind of mower that you purchase would depend on the kind of grassy slope you are looking to maintain. 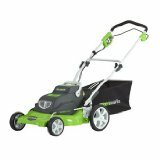 Cordless electrical lawn mowers are usually ideal for customers having smaller sized lawns. Since the cordless lawn mowers are charged before hand, they are usually effective only on small area grasslands. On the other hand a corded electrical lawn mower would provide better service as it is connected to a power source at all times. But a chorded lawn mower can be the worst nightmare for some people who are not to comfortable with maneuvering a chord at every turn, while mowing. And moreover, an attached chord to the lawn mower means there is not too much space to move around and you can cover only a limited area. But no matter what the downside of electronic lawn mowers may be, they are definitely a much better way to get the job done than a gas mower. It is no wonder then that there is a rush in demand for new and improved electric lawn mowers. A large number of stores are even offering great discounts and amazing exchange offers for their customers on the electric mowers. Some stores even provide exchange offers where customers can buy a new, shiny electric lawn mower by trading in your old gas mowers. The new products may sound and look too good to be true but it is always prudent not to forget that electrical products mean huge amounts of electricity consumption. That is why it is always advisable to go for lawn mowers which promote the energy star symbol. When compared to conventional models, an energy star lawn mower will use up to 35 % less electricity. That means you save on electricity as well as your money. But at the same time, you are not required to compromise on the quality of work. Energy star lawn mowers come with energy star chargers to give customers a thorough job on their lawns without polluting the environment or making a dent in their pockets.